1 of 3 Coat slow cooker bowl with nonstick cooking spray. In medium-size bowl, toss the chicken thighs with flour. Combine in slow cooker with green beans, onions, tomato sauce and 1 cup water. Stir to blend, then add 1 tablespoon of the paprika, the salt and pepper. 2 of 3 Cover slow cooker and cook for 4 hours on HIGH or 6 1/2 hours on LOW. 3 of 3 In a small bowl, whisk sour cream with remaining 2 tablespoons paprika. Scoop 1/2 cup sauce from slow cooker and gradually whisk into sour cream. Slowly stir sour cream mixture into slow cooker. 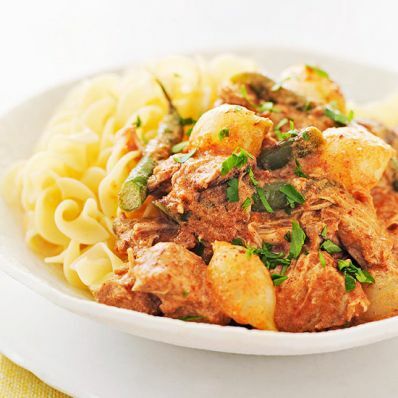 Serve paprikash over noodles.